Edmonton’s architecture scene is a growing, vibrant industry and we have the local talent to match. While many of our city’s headline-grabbing projects involve organizations from outside our fair city, we have plenty of homegrown architects and designers worth bragging about. From businesses that have been around for over 70 years to interdisciplinary partnerships that blend architecture and graphic design, here are four local firms that shine. Founded in 2010, this boutique architecture and design firm says that their claim to fame is they “don’t do cookie-cutter.” And the proof is in their portfolio. 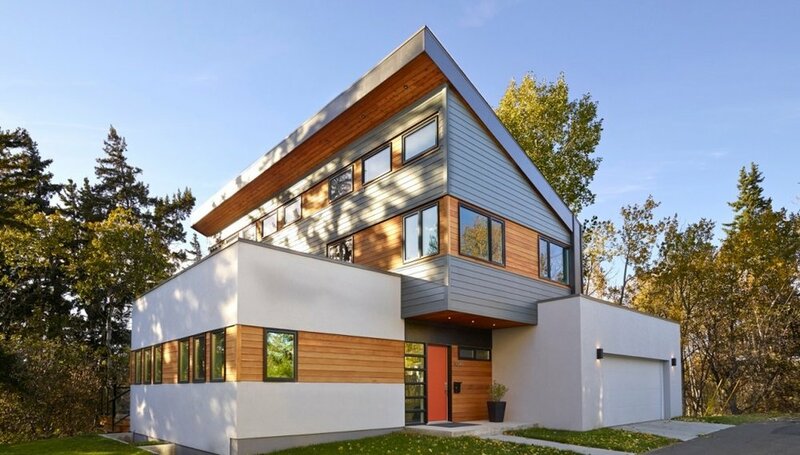 From St Albert’s Enjoy Centre to a California vineyard to a custom home overlooking Edmonton’s Mill Creek Ravine – dubbed the “Urban Tree House,” E3’s designs are an eclectic bunch. Plus, principals Ernst von Meijenfeldt and Eugene Silva have over 55 years experience combined. When Edmonton firms HIP Architects merged with Kasian Architecture in 2012, it took the two well-respected, decades-old practices to new heights. Known for embracing new technologies and a strong client-based approach to design, Kasian is one of the leading 100 architectural, interior design and planning firms in the world. Their Edmonton Federal Building restoration project, completed in 2015, is an award winning LEED Gold structure that seamlessly blends heritage and sustainability. An interdisciplinary studio that focuses on all things creative, Land Faculty partners Joshua Kupsch and Hannah Braun develop brands, places and experiences. Local eateries like Clementine and Meat show-off the firm’s blend of vintage modernity, and their interior design work for the 2015 restoration and renovation of Jasper Avenue’s Alberta Block nods to the historic building’s past tenants, while recognizing its role in downtown Edmonton’s present. At Cadillac Coatings, we have an appreciation for our city’s local talent. In fact, we consider our staff to be on that list. Our patented power coating technology is one-of-a-kind – just like our team members. To find out more about our one-of-a-kind powder coating process – and our one-of-a-kind team – contact us today!